Category types that appear in your site’s navigation bar will have a number next to them. This is to highlight the different number of product types that you might have for each category. As your site increases in size, the product count will ultimately slow down the time it takes to generate your navigation bar and site wide product listings. Popular extensions such as Category Product Count and Remove Category Count will help to remove this feature and improve your site’s performance. 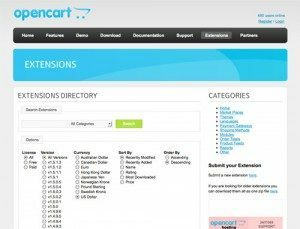 Extensions are a powerful way of extending the feature set of OpenCart beyond what it already provides. Too many extensions, or the use of poorly written extensions however can hinder the performance of your site. Keep the use of extensions to a minimum, and only use trusted sources such as the OpenCart Extensions Library to read and review third party extensions. 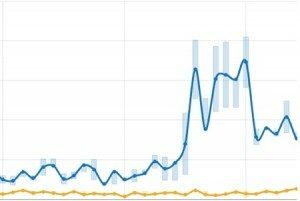 If you have a large number of categories in your OpenCart store then performance will start to suffer. This is problem is due to the way that OpenCart manages the category cache files whenever you add, edit or delete a category via the admin area. By default OpenCart will delete cached files after an hour and rebuild them again. If you have several thousand products in your store, then this process of cache rebuilding will take a considerable amount of time. One way to resolve this issue is to use a category cache extension which will modify the default caching behavior for category generation. The cached files are set to never expire, and they are only rebuilt when you actually edit a particular category. Category Cache Fix is a popular OpenCart extension for managing the OpenCart category cache. Most modern web sites are dynamic in nature meaning the content of a page is generated on the fly each time a visitor arrives to the site. Material such as products, descriptions and pricing are drawn from the OpenCart database to create the final page your visitor sees. Page Caching is a service that allows dynamic web page content to stored and generated as static HTML files. The benefit popular pages are retrieved from the page cache and not generated dynamically from the OpenCart database each time a visitor arrives. This provides a dramatic improvement in performance particularly if you have hundreds or thousands of visitors arriving each day. OpenCart Page Cache is an extension for OpenCart that will help to generate a page cache for your online store. 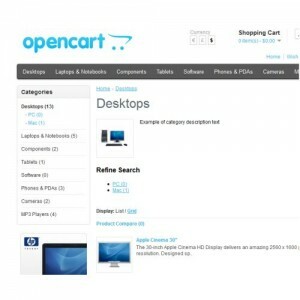 Like many other modern web applications, OpenCart is written in a popular scripting language called PHP. As your OpenCart store increases in size and complexity you will need a more responsive hosting solution that can be scaled up to provide more RAM, CPU resources and storage as required. For a growing ecommerce store an Web24 VMware VPS Hosting package will be the best choice for providing a fast and reliable online shopping experience with OpenCart. OpenCart can be installed for free using our 1-Click Script Installer, Installatron.